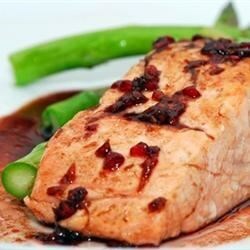 "This is an easy to prepare salmon recipe with a wonderful sweet and sour glaze." Mix ginger ale and water in a saucepan, and bring to a boil. Reduce heat to a simmer; stir in lemon juice, 1 tablespoon lemon zest, raspberries, and sliced ginger. Bring to a boil, and cook over medium heat for 30 minutes, stirring occasionally. Strain the sauce through a fine strainer into a clean saucepan; discard solids. Stir sugar into strained sauce, bring to a boil over medium heat, reduce heat, and simmer until the sauce has thickened, about 10 minutes. Remove from heat, and allow to cool while you prepare the salmon. Coat salmon fillets with olive oil; sprinkle with sea salt, black pepper, and 1 tablespoon of lemon zest. Place salmon fillets into a broiler-proof baking dish. Brush salmon fillets generously with raspberry sauce. Bake in the preheated oven until salmon is almost opaque in the center and the fish flakes easily, about 10 minutes. Turn on the oven's broiler, and broil the fillets until browned, 2 to 3 minutes. Serve with extra sauce if desired. See how to make a quick glaze for grilled or broiled salmon. Very good and easy. Next time I think I will use raspberry preserves instead of the frozen raspberries for a stronger raspberry flavor. We live to fish for salmon on Lake Superior.I am always looking for new ways to cook this great fish. This recipe is not bad but, I would use less sugar. I would try it again in the future. I used 1 cup (seedless) raspberry jam -- and this was THE best salmon I've ever had. My family couldn't get enough -- including 6 year old and 8 year old! This is delicious!! We loved it, this recipe is definitely a keeper for our family!!! This was so good! It's a perfect dish to cook for a date!